Acupuncture is a natural way to boost your immune system. A strong immune system means you are less susceptible to illness and disease. Along with numerous other benefits, this one is especially useful this time of year. Wouldn’t you love to get through this chilly, windy season without the dreaded cold or flu bug taking a bite out of you or your children? The secret is a healthy, strong immune system. You have to be able to fight the bugs, or they win and you get sick. End of story, start of aches, pains, coughs, runny nose.....you get the picture. Acupuncture boosts your immune system so that you are able to fight off the bacteria and viruses that flourish this time of year. The great part is that there are points you can press on your own, between regular acupuncture appointments, to help increase your chance of staying healthy. Acupuncture works great as a preventive medicine. In fact, the Chinese say that the best doctors are those that treat an illness before it even shows up. Often, your doctor of Traditional Chinese Medicine (TCM) can detect subtle signs that a cold/flu bug is trying to get you. Don’t wait until you succumb to an illness, take proactive steps to avoid getting sick in the first place! There are four great points for strengthening your immune system and all of them are easy to locate and press on your own. The effects from pressing these points will reduce your likelihood of getting sick, and if you’ve already been sick, they will help to prevent a second go around. Stomach 36 - voted best all around wellness point! 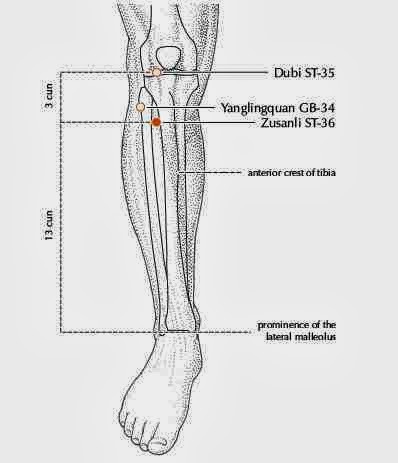 ST36 is located toward the outside of the leg, about a hands width below the lower border of the knee cap. 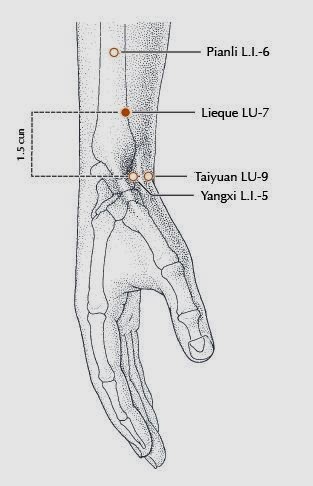 This point is the star of the acupoints - its functions include boosting immunity and boosting energy. When you press this point, it is often tender and may give you some sensation either up or down your leg. This is normal, as the Stomach energy system starts on the face and ends at your second toe. The uses of ST36 are many - from helping to strengthen a deficient immune system to helping with shortness of breath during early pregnancy. It truly is an amazing point! Connected directly to the Lung organs, this point will help strengthen the lungs and provide protection from invading virus and bacteria. Your respiratory system, namely nose, throat and lungs, are generally how the nasty bugs get inside us to make us sick. Strong immunity in the lungs means less likelihood of the bugs being able to grow and cause us illness. If you hold your hands up with fingers together and thumbs spread wide to make an “L” shape, then place the crook of your your left hand inside the crook of the “L” of the right hand, your index finger will touch L7 along the side of your arm. See the picture - it’s not nearly as complicated as it sounds! 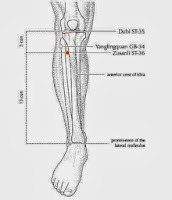 LI11 is connected to the Lung meridian in Chinese medicine. It is typically used for fever, but is well known for boosting immunity and prevention of colds and flu. There are a few ways to locate this point - the easiest is to bend your arm and see the crease made at your elbow. 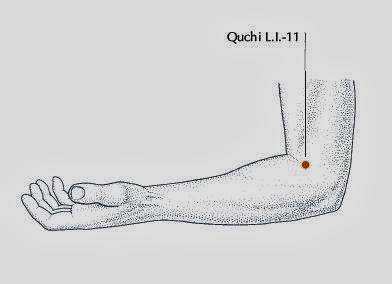 LI11 is found at the end of the crease on the outer side of your arm. You can feel around a little bit as often there will be a tender area. That will be the best place to press. This point is great at boosting the immune system and because of its location on the chest, it is especially good for conditions that affect the lungs. The Kidney energy system works with the Lung energy system in helping to inflate the lungs. If the Kidney system is weak, we often see symptoms such as difficulty breathing (especially inhaling), cough, and fatigue. When you can’t breath, you can’t do much of anything else either. That’s one of the reasons why we feel so tired and drained when we have a cold or flu. K27 is located just under the collar bone, about 2 fingers width from the midline of the chest. You can often feel a small depression that will sometimes be more sensitive than the surrounding area. Get into a relaxed position with comfy clothes on that allow you to press each of these points. 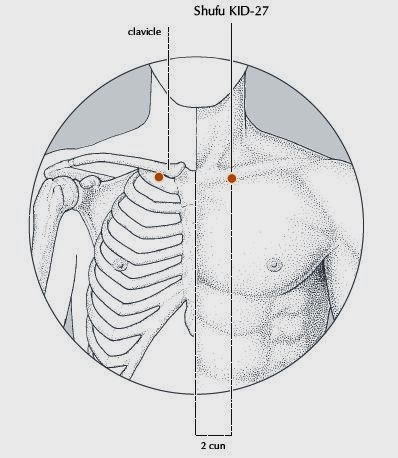 Each point is located on both sides of the body. You can easily press K27, LI11, and ST36 on both sides at the same time. L7 is a bit trickier, so do one side at a time. Locate ST36 and press. I always give ST36 an extra 30 seconds just because it is such a great point for overall wellness. L7 you will need to do one side at a time, but same process - locate the point and press for about 30 seconds. Then move to LI11 and repeat this process. 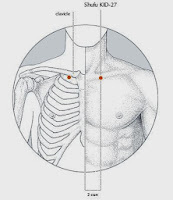 Lastly, locate K27 on each side of the chest and apply firm pressure for about 30 seconds. How often should you do this? I recommend twice per day. Convenient times are when you get up in the morning and before bed. If you are someone who tends to get sick often or if you have been under a lot of stress, you can repeat this routine three or more times per day. The more you do it, the more “boost” you give your immune system. 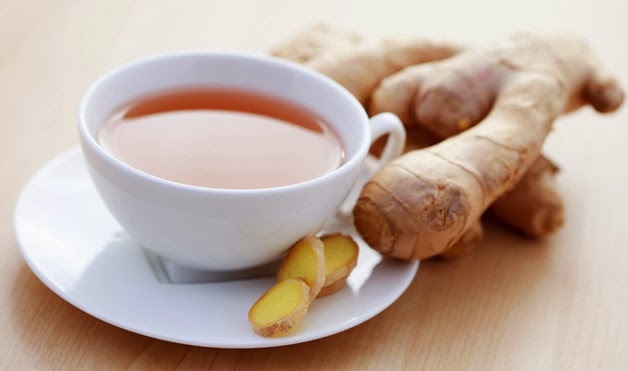 If you feel like you’re getting sick, start drinking the tea below and get in to see your TCM Doctor!! She can do a treatment as well as prescribe herbal formulations that may prevent you from coming down with a full blown version of the cold or flu. Treatment at an early stage will lessen the severity and shorten the duration of the illness. Put water and ginger slices in small pot and bring to boil on stove top. Simmer for 20 minutes with lid on. Pour into a mug and add honey/sugar to lightly sweeten. Drink. The purpose of this tea is to “release the exterior” - in plain English, that means push the bugs out, preventing them from setting up shop in your nose, throat and lungs. This tea may make you sweat a bit and that’s a good thing. It’s part of how your body gets rid of the pathogen (the bug that is making you feel crummy). Enjoy the relaxing health benefits of Acupressure between your regular Acupuncture appointments. It’s a great way to keep your immune system strong and get you on your way to being cold & flu free this season.